So far in the Wardrobe Architect series, we’ve talked a lot about examining personal style and context. We’ve talked about defining your core style with words and images. We talked about shapes that work for us, and combining those shapes into silhouettes that act as templates. We talked about color stories, and how to organize colors into useful palettes. We discussed solids and prints. Finally, we talked about the non-clothing stuff such as hair, makeup, and beauty routines. This is all great stuff to have pinned down, but how do we make it practical and useful in our daily lives? How can we use it to organize our sewing priorities? Or to decide what’s worth buying? 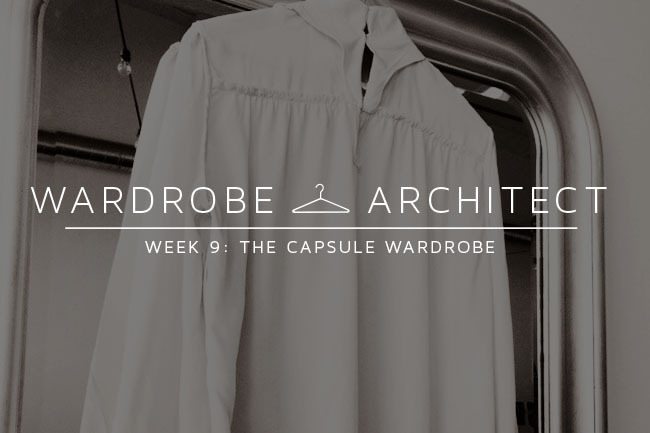 Though I’m sure there are any number of ways you could use this information to streamline your wardrobe and plan your sewing, the method I’ll be focusing on is the capsule wardrobe. A capsule wardrobe is a small, manageable subset of your wardrobe, and it usually is something you can plan seasonally (twice a year, or perhaps 4 times a year). A typical capsule wardrobe consists of between 20 and 33 items, depending on who you ask and what kinds of items you’re including. It doesn’t have to include every single thing you might wear for the season, but it is the foundation for the rest of your wardrobe. The idea is that once you have the capsule wardrobe figured out, the rest is gravy. Personally, I’ve always failed at building capsule wardrobes in the past. Why? Because I wasn’t excited about them. I’d make a list of items I thought I might need or want, but I was never really 100% sure I’d chosen well. Because I wasn’t certain and I wasn’t excited, I was easily distracted. I put off buying anything expensive, even if I knew I’d wear it all the time. I bought stuff on sale just because it was on sale. I threw myself into sewing projects I’d rarely wear. All of that changed when I started thinking more deeply about what I actually love to wear – the mood, the silhouettes, the colors – and methodically building a plan from there. The idea is simple. And I’d like to give big thanks to the blog into-mind who goes into much greater detail on these topics and really pulls apart these concepts. Choose one to six silhouettes for the season. Break down your silhouettes and colors into a list of pieces. Organize what to make, what to buy, and what you already own. Today, let’s focus on choosing our silhouettes for Spring/Summer 2014.
Review the silhouettes you came up with a few weeks ago. These should basically be outfit formulas or templates you created based on your own preferences and lifestyle. Which of these silhouettes would you like to make the basis of your wardrobe this Spring? You can choose as few as one silhouette, or your could choose perhaps 5 or 6. If you want to keep things extremely simple and easy, choose fewer. If you (like me) prefer a lot of variety in your wardrobe, choose more. After looking through my own, I chose four of my Spring/Summer silhouettes. I may also decide to tweak one or two of them to add more variations. Keep in mind, these aren’t the exact outfits I want to buy/make/wear, or the colors I want them in. These are just four templates for future outfits I might plan. After we create a palette for the season, we’ll get into designing the actual pieces we need. I know that I’ll probably add and subtract as I sew and as I review stuff I already own. I also know I’ll want to make things that aren’t part of my capsule wardrobe. In addition, our weather here remains cool up until May, so I plan to keep wearing mostly my lighter colored Fall clothing up until then. Most of the year here is sweater weather, so I just go with the flow and define my wardrobe change-over accordingly. This kind of flexibility is fine! Nothing is written in stone, this is just an organizing device. Do you prefer a lot of variety in the kinds of outfits you wear? Or do you stick to just a few (or even one) type of outfit? PS: For even more detail on capsule wardrobes and methodologies, check out the into-mind blog. My method is sort of a simplified and step-by-step approach that uses many of the fantastic methods she recommends, so it’s good extra credit research if you want even more ideas and details. I’m actually trying to make my whole wardrobe something of a capsule wardrobe. I’m really paring down things I own. My SO and I are planning to travel a lot in the coming years, and it’s just going to be nice to have to worry about less stuff. I was pretty ruthless in my closet purge the other day, even getting rid of things I had sewn that just don’t work for me, or work well in my wardrobe anymore. It never even crossed my mind to build a capsule wardrobe before! I do not know if I will actually make it but I’ll give it a try. I do prefer variety but i find myself wearing the same things over and over again … maybe I should try to build it around those items. It seems hard enough thou to eliminate the wishful thinking factor and be realistic about it. Over the years I’ve learned that a good capsule wardrobe for me is black pants/jeans/skirts and fitted Ts or silk tops, then I sew the accent pieces, such as Chanel-style jackets, Vionnet scarves, and Schiaparelli wraps. Then my wardrobe goes right in a suitcase, and I’m ready to go for almost anything. Crap, I knew that having trouble with exercise 4 would come back to get me. For whatever reason, the “silhouettes” thing is really not easy for me to visualize and narrow down. But maybe adding the seasons as another filter will help — I certainly won’t be wearing miniskirts in the dead of winter! Lol, I do, though with tights or leggings. Really, the only things in my wardrobe I consider to be totally seasonal are shorts. Everything else I can add or subtract tights/leggings and a sweater. Ugh, same here! I’m still stuck way back there. You can do 5-8 without doing 4! Just jump 4 for now. i’ve slacked on the last few weeks’ tasks but i need to get back in and catch up! i like that your idea of a capsule wardrobe can be so varied (and big). i’ve never been excited about the idea of a capsule wardrobe as talked about in magazines as they tend to be about 8 items all in neutral colours so a bit boring for me. the reason is i love variety. i like lots of different items in a range of colours. i just cannot do the whole uniform thing! i wear lots of different outfits. i love dresses, both knit and woven, i wear jeans and trousers and skirts. seasonal dressing calls for layers here. i also can dress how i like for work so no restrictions there! sewing really helps with this – i have more variety in my wardrobe since i started sewing than i have had since i was a child and i feel better about my wardrobe choices in the morning. Lol, I’m very 50s in the silhouettes that I wear. Either fitted up top with a full (sometimes just flared) skirt, or fitted top and fitted skirt. Sometimes in the summer that is amended to include a tshirt or tunic with shorts, but for 3/4 of the year it’s either fit ‘n’ flare or just plain fit pretty much all the time. I tend to stick to basic silhouettes – jeans/tees, jeans/button-downs, jeans/tees or camis/cardigans, a-line or pencil skirts with knit tops. I’ve recently added leggings/tunics to the mix – they are very comfy for chasing around my three youngsters, but I’m still not entirely sure I can pull them off! I’ve never really thought about my wardrobe before in such depth, and since I’ve started sewing last year, I’ve really enjoyed all the exercises posted here. It would seem I’ve always had a capsule/ standard wardrobe, a uniform as some might say, but I’ve never thought about it in those terms. I have a “winter” pant and skirt, worn with a few sweaters or long sleeve tops; and I have a “summer” pant and skirt, worn with a few light-weight tops or knit shirts. To accessorize, I have several “winter” scarves, several “summer” scarves, and the same for hats and shoes. I do also have specialized clothing; evening/ ballgown wear for formal events, as well as “resort” wear for vacations, hiking gear, but these are only used once or twice a year. This is probably my personality coming through – too many choices equals indecision for me – having to just choose a top to go with my pants – my only pants! – is a better system for me. I have been working toward building myself a capsule wardrobe — although I’d never heard of the phrase until I started this project. I want most things to go together and just kind of work. I like some variety in my silhouettes, but when I venture too far from fitted shirt/full skirt, fitted top/skirt, fitted top/wide-leg trousers, loose top/leggings I tend to get panicky that it doesn’t work. I then psych myself out and won’t wear it, even if it does look good. There was a time where I wore an unofficial uniform of black pants and colorful button up the front shirts. After I realized that was the wardrobe of a high school teacher, I decided to change and incorporate more variety. I’m learning a lot from this exercise. Most of all, I’m learning that I need to expand my silhoettes and slim-down the colours I choose. I have a whole hodge-podge of colours I never wear in my closet. I think the challenge for me is going to be paring it down to just a few– I like variety! But sewing time is hard to come by during the spring months in particular, so I think the best thing for me right now for working through this exercise is to base it on things I already have, and just try to sew a few extras. I have a good supply of basic skirts, and now pants thanks to my winter sewing binge, so if I choose my colors carefully, I can probably focus more on sewing a few fun tops and maybe a dress or two. And then work on this again in the summer when I have a little more time again. I took about 45 minutes and managed to make myself a little spreadsheet of what I wanted in my wardrobe, based on the silhouettes. I have a solid start of things already in my wardrobe, and I solid list of things I already intend to sew — patterns altered, material procured. I am feeling pretty good. It isn’t nearly as overwhelming as I expected it might be. Hello! I just joined last week and im catching up with the exercises. For me the most difficult is to link up my ideal capsule wardrobe with the British weather. Every year I convince myself about wearing more dresses in the summer but then I end up in my jumper and jeans because im cold in July. I love wearing dresses, definitely my favourite silhouette, but I just cant face the weather. How do you guys get arond it? This is something I struggle with, too! Oregon has such fickle weather that it can be 85 in July or it can be 55 and raining. And it’s definitely drizzly/cold all winter. I think the key is warm fabrics, tights, and boots! I have so many floaty, warm weather dresses when what I really, really need is cold weather clothes. So while I have to fill that void in, this winter I’ve been wearing fleece-lined tights (seriously. They are amazing), wool skirts for warmth. So I think the key is to dress for the weather versus what the season looks like in our heads. Layers, warmer fabrics. And embrace the cardigans. I am pretty slender and get cold pretty easily so I’m a huge fan of cardigans even in summer. And if you need to wear tights in July then wear them! I’m in Chicago and I second fleece-lined tights–even during our brutal winter this year, I’ve worn skirts and dresses most of the time and I felt like the fleece-lined tights were warmer than pants (especially if you layer a legging or thinner pair of tights underneath). I also recommend getting a nice silk slip to layer under your dresses and sweaters. Not only will it keep your wool skirt from sticking to your tights, it keeps in the warmth without adding a lot of bulk. Silk and wool are the magic fabrics for staying warm all winter long; anything acrylic or cotton just isn’t going to cut it. I third the fleece tights! Im in Colorado with similar weather issues. Merino wool is a loyal companion for me all year long as well. It keeps you warm in the winter, and breathes well in the summer. Plus its thin enough that you can add a few layers of it and you dont look like a marshmallow. Ive also taken to wearing skinny jeans with my dresses when its too cold to go bare legs. Its sorta bohemian, but I just love the idea that Im wearing a dress and Im not freezing. Where I live we have the other half of that problem. It can easily be in the high 70s in the middle of winter. I can’t recall the last time I wore a coat. I deal with this by using light tropic wool. It can be “floaty” (depending on the weight) and works well as skirts and light jackets/blazers. It’s been great reading this series, it’s something I’ve also been trying to get started for years! So this is the year I’m really going to try to organize myself. By the way, there’s a blog that I stumbled upon from Carolyn’s blog (Diary of a Sewing Fanatic), called The Vivienne Files that also looks at many kinds of capsule wardrobes, it’s been a great source for ideas. Hope you don’t mind me mentioning it. Flexibility is definitely the key! I was enjoying this process so much: I had my existing wardrobe (almost) honed down to the few workable items, my silhouettes and palette selected, and a sewing plan for the gaps in a beautifully curated new wardrobe already in progress. But it was all in expectation of a job offer that did not come through. Boo! I love this idea, but I’m still struggling with a mommy wardrobe that looks nice. I’m sticking to a few colors so everything matches but still.. When I worked in an arts fundraising office with clients that had lots and lots of money, I had to think about what I wore and how to keep it clean and appropriate. As a mom, I’ve had to think about flexible, warm, machine wash AND dry, with lots of pockets. Now that I’m doing both, I have really tried to remember my real style icons (my boss Judy! who taught me about Chanel jackets) and have stuff that doesn’t look like I just did a shift in coop preschool on fingerpainting day. Dressing up or down basic pieces is something I never used to think about, and now it’s key. I am focused on good fit and good fabrics, over quantity; if I like something, I will make it over again in something better and wear it more often. The funny part is I’ve started making custom pieces for some old clients whose clothes inspired me! I’ve taken this route in the past, and here’s where I run into a problem. I nail down my silhouettes, but when I go to buy, I can’t find what I want in the particular colors, shapes, etc. I end up buying alternatives but in the end, it doesn’t go with what I have. This year, I’m taking a different approach, and not buying alternatives, and sticking to my plan. If it’s not available, then wait or sew it. Its funny, I look in my closet…..everything is organized by color, not season. Blue, black & grey on the top row…..yellow, pink, red, green & white on the bottom row. It seems there is a merino wool cardigan and shell in every color and a smattering of collared shirts. There are also tailored chinos and a-line skirts in nearly every color as well. Dresses are either merino wool (winter) or light and summery. Its funny, I suppose Ive created color capsules rather than functional ones and it may be time to re-think my arrangement. Lots of my clothes are thrifted, so it will be easier to part with certain items. Plus I like to think about how many times a single garment gets bought and sold! Sewing skirts are so easy and I find that this is the one garment that I use to create variability in my wardrobe. Im also becoming quite enamored with the laurel dress, and find that it’s a great spring transitional piece. I like that its looser fitting, so it hides some of the winter padding, but its still feminine and gets me through the spring weight transition. I even wear it with skinny jeans and a cardigan on the colder weather days. YES! I too have been musing over the idea of sewing a capsule wardrobe. I especially love the idea of sewing a capsule travel wardrobe, that would be the most fun. Last year I ended up sewing a print heavy wardrobe with nothing that went with anything. Now when I planning my hand-made closet, I’m thinking about what’s going to go with what.
. I find the blog Into Mind very inspirational. She has different techniques for building a capsule wardrobe. You can use items that are interchangeable, or you can have a core of basics balanced out by statement pieces, so you have options for very simple dressing, or dressing up. I think that concept might result in a more versatile wardrobe which would work better for me. As you can tell by my massive capsule wardrobe list, I love some variety in my closet! However, I always come back to some key pieces I adore… which can become a problem because they get tattered or faded. I want to add more pieces that get me genuinely excited! I wish you had linked the discussions to your bullet points, I would like to review the information in them but “we talked about” isn’t really enough information. That’s weird, I thought I had. Maybe I accidentally reverted to an old draft when I published the post. Anyway, I added the links, so you can click through to those posts now. I think that I like a lot of variety, but after doing all these exercises, I’m coming to the realization that I don’t buy what I’d like to wear. All too often I buy or make pieces based on a whim, the clearance sticker, etc., which is why my wardrobe doesn’t work for me. Once I narrowed down what silhouettes I want to wear, I realized where the gaps were in my wardrobe and that what I’d like to wear would be more flattering and express more of the image I want to portray than my current wardrobe. Thus, I don’t think I need the variety as much as I thought–I’ve just been floundering, trying to figure out what would work. I’ve already started taking more care in buying fabrics for spring/summer items, and this exercise helped me see exactly what I still need and what I already have. Thank you so much for this series!